#3 North Attleboro, 0 vs. #19 Medfield, 1 – Final – North Attleboro was done in by a first-half goal by the visiting Warriors of Medfield. Medfield used a counter attack down the right wing, a cross that was headed and saved by goalie Brendan Matracia, but then buried by sophomore Matt Thompson on the rebound. “In the second half, every time that we got something going, we committed some type of foul, we killed ourselves in that regard,” said North Attleboro head coach Geoff Burgess. North finishes the season 11-2-6. #4 Oliver Ames, 4 vs. #13 Whitman-Hanson, 0 – Final – Oliver Ames had an ideal start to its first playoff game, scoring four goals in the first half to advance past Whitman-Hanson. Senior Matt Alvarado converted a pass from Nathaniel Cardoza to give the Tigers a 1-0 lead, and then Alvarado set up classmate James Gillespie to make it 2-0. Michael Nikiciuk scored a pair of goals inside a five-minute span to add to OA’s lead. OA senior goalie Jack Carroll saved a penalty kick in the second half to preserve the shutout. #4 Oliver Ames will host #12 Walpole (10-6-2) on Thursday with a time still to be announced by the MIAA. #9 Foxboro, 4 @ #8 Canton, 1 – Final – Click here for a recap and photo gallery of this game. #5 King Philip, 2 @ #4 Bridgewater-Raynham, 0 – Final – King Philip sophomore Avery Snead scored her 29th and 30th goals of the season, one in each half, to help the Warriors advance past the Trojans. Snead scored on a cross from Chloe Layne in the 37th minute, and then added a big insurance goal in the 76th minute. #8 North Attleboro, 0 @ #1 Natick, 3 – Final – Natick scored all three of its goals in the first half to hand North Attleboro the loss. Big Red finishes the season 14-3-3. #5 Foxboro, 0 @ #1 Dennis-Yarmouth, 1 – Final – Top-seeded Dennis-Yarmouth scored off a scrum in front of the net with just 1:56 to play to end Foxboro’s postseason run. The Warriors finished the season 15-4-2. #2 King Philip, 3 vs. #7 Arlington, 0 – Final – After a lengthy period of time off between the regular season and postseason, King Philip opened up tournament play in style with a 3-0 (25-17, 25-18, 25-18) win over visiting Arlington. Sydney Phillips put down 15 kills while adding 10 service points, including two aces while Michaela Palumbo chipped in with eight kills, Julianne Rando added 11 digs, Elise Pereira had seven digs and six service points, Rachael Veilleux had 10 service points and 24 assists and Olivia Atkins finished with 10 digs. #2 King Philip will host #6 North Quincy (14-7) on Thursday at 6:00. #6 Franklin, 0 @ #3 Hopkinton, 3 – Final – Franklin went on the road and gave the third-seeded Hillers a big test, especially in the second half, but came up short (13-25, 24-26, 18-25). Hailey Sanders had seven kills and a block while Meaghan Maguire added four kills and four blocks to pace the offense. 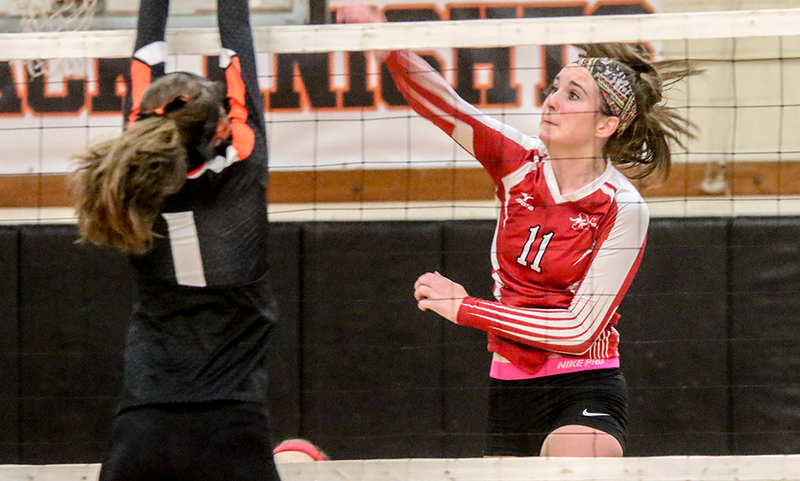 Lauren McGrath finished with 24 assists, eight digs and three aces while Riley Marino had 16 digs for the Panthers.